When the UPS man arrives out in the country it's always exciting! The dogs are barking and attacking the windows and doors just trying to get out and be the first to lick the UPS man to death. I'm sure those delivery people are sick of my dogs and their threatening barks. But nevertheless, we are all excited when we see the brown truck come down the drive. This delivery was from Cheryl Freydberg, Design Director, of Moda Fabrics. Her packages always mean that our newest fabric line is progressing to the next stage. When Barb and I work on a new fabric line, we have to choose items that convey our color choices to Cheryl and the mills in Korea. We have tried sending floss, paint chips and even wool swatches to convey the hues and shades illustrating how we want the prints colored. Above is the beginning of Blueberry Crumb Cake. I thought a limited two color palette sounded like the perfect recipe for fun. The soft and restful look of old pieced two color quilts are favorites of mine. The blue tones in this line are based on an old faded piece of antique fabric I found. After we approve the color swatches, the mill will begin to color our prints. I'm loving the blue and brown tones. Makes me eager to see how the prints turn out. Speaking of Moda fabrics they are having a blog hop starting Feb. 1st. We are on for Feb. 2nd. click on the link above and it will take you to their blog for details. Look for a contest here on the 2nd and more details about my sleeping arrangements than you probably really want to know! And your comments are just too funny! Thank you for taking the time to respond in the comments section. I laughed all the way to bed last night after reading some of them. After reading Terry's comment, I will never look at this candle from Pottery Barn the same! At first I thought the candle was a glass of milk you'd magically flamed - the perfect drink to go with fire-roasted bread! Glad your fire was just a little one and that your grandmother's crock survived unharmed. Small update on cross stitch market. I'm working on the project book, A Stitcher's Journey. It's going to be jam packed with the projects we taught last year....plus an added extra. More details and cover shot soon. This will be released at Market. We have a plan for Loose Feathers and it will begin after market. We will show a preview to shop owners in Nashville. Of course I will show details here on the blog as soon as I have the patterns ready to print. 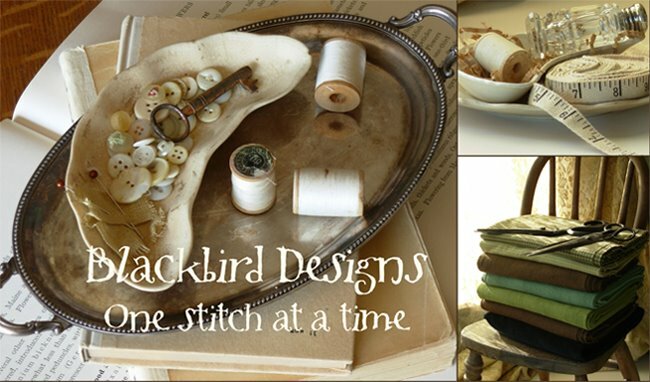 Can't wait to see your new fabric and the new project book--A Stitcher's Journey. Haven't been commenting but been checking in on your blog posts. Hope all is well with you two. Oh, blueberry crumble -- it sounds wonderful! I love blue and brown!!! Can't wait! Can't wait for your Nashville releases either. I am so doomed! lol! When my friends and I get excited about stitching we say we are 'TORKED." Reading about your update on the Nashville market has made me 100% torked!!!!! Please know that we are all waiting with baited breath for news and pics!!! and the goods themselves!!!! Wahooooo! Blueberry Crumble... I'm hungry now!! ;) The fabric combo sounds like it'll be another amazing line from you two! Like Laura said, I can't wait to see all the new goodies coming out at Market! I can't wait to see what you have planned for marktet! Oh I love the blues and browns. So restful. Love the baking bread too. I love to bake bread but since there is just two of us---we don't need to eat that much bread! I am going to get that book then share my breads! 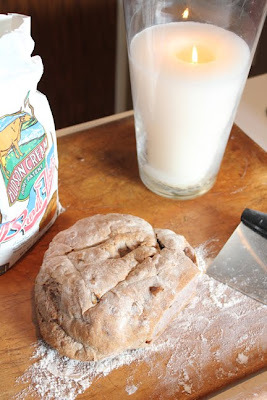 Bread, candles, cross stitch, fabric all in one post!! By George I think I have hit the Trifecta of blog reading!!! Woot!! Woot!! I was happily imagining the wonderful smells coming from your kitchen until I read about the fire. Serious buzz kill there don't 'cha know!! Glad to hear there was no major damage and that the crock made it thru. Okay so the first thing I thought of when I saw your dough was feet...little messed up Chinese bound feet....I know I am seriously wierd and disturbed!! But there are like little toes on the left side there...really!! Maybe it's the book I'm reading that has me seeing these things!! LOL! Many many grateful thanks to you for your blog. I do enjoy it so much! I am so looking forward to your Blueberry Crumble line. There has been a blue and brown quilt trying to push its way to the front of my brain for months - this may be the inspiration for it to finally break through. Thank you for the sneak peek. My favorite shades of blue. Good job. The new fabric sounds delicious!Looking forward to the new book too.At the rate two are producing projects I will soon be on "The Horder"show. Thank you for the Loose Feathers update, Alma. I'm happy to hear that you'll continue the series. The new fabrics look yummy. Harvest Home is my favorite line to date. Love the name. Love the colors. I like a departure from those Moda reds. Gorgeous colorway!!! And it goes without saying I can't wait for your market releases :-). The fabric is very pretty and soothing. Can't wait to see what you have lined up for market - and pardon me, were those the LF words which you just said?? I am really looking forward to A Stitchers Journey and whatever else you release at Nashville! I had to laugh because I live out in the country too. I have 2 Golden Retrievers and they go crazy when the UPS truck stops. My UPS guy give them dog bones. So that makes them more excited. The blues and browns of your fabrics are so pretty together. I am very excited about your releases at Nashville. I am stitching on a project right now that I know won't last until Market, but I have no plans to start anything else until I get your new patterns. This is gonna be a long month! The swatch samples of Blueberry Crumble are absolutely beautiful. May just be the perfect colors to use in a big boy quilt for my youngest grandson. A set of star blocks, or lone star, or ??? who knows what I will end up making for him. I'm half Korean...I think I should get first dibs on the fabrics! 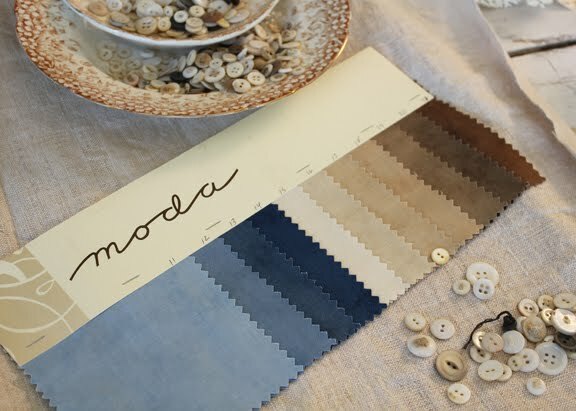 I love those shades of blue and brown, I am definitely going to have to make a quilt with those colors. Blueberry crumb cake....my grandmother made a blueberry cake and I still make it from her original recipe...your wonderful new fabric just brought back fabulous memories...and maybe its time to bring out the recipe again! Perfect colors in Blueberry Crumbcake! Can't wait!!!! Ooh, I just love 2-color quilts-- They are highly underrated. I just so look forward to your new book of projects, patterns and ideas. I don't know how you get so much done and manage to bake bread--okay, blacken bread sometimes--and take care of the house, pets, design, coordinate trips, etc. I am most impressed! Hi Gals: First I want to say a very belated thank you for the set of four sample swatch packs from your line Antique Fair - something special will be made from those once I decide - almost there! Your bread disaster sounds like me - I am seriously thinking of a breadmaker to ease my woes! And finally - what's not to like about those blues and browns - will be awaiting the next bit of news and teasing pictures - looks like another "must have"
Happy "spring is just around the corner" - it will soon be maple syrup time. I LOVE the colours of your fabric!!!! Your color swatches are so peaceful. I am anxious for the new line to be on the shelves. It has been a while since I've used much blue, so this will be a real treat! I'm trying to get multiple projects from your last quilt book done, though! I ordered the kit for Garden Plot from Jeannie. My friend Susan was going over the pattern with me and noticed you had one half square triangle turned opposite from the rest - 10 rows up from bottom, 8 in. Any significance to that? Hope the bread making is going better! I'm making bread daily and it's getting easier. There are 2 loaves in the oven proofing right now. I'm going to send them to my mother-in-law. She likes rustic breads for her morning toast....now to the triangle. I would chalk it up to piecing all day and just turn the triangle the wrong way when sewing. Barb didn't notice it until it was quilted. This is no "humility block." It's a myth that Amish and Mennonite women put a mistake in each quilt because only God is perfect. Who really thinks they have made such a perfect quilt that they need to add a mistake? Most of us are already too critical of our own work to need to sit at the sewing machine and make a mistake on purpose. Yesterday I asked my husband which colors he'd like in a quilt. His reply, "Blue, cream and brown." Wow! I can't wait until Blueberry Crumble gets to my local fabric store! I absolutely LOVE the colors in Blueberry Crumb Cake. They're so good I want to eat them! Can't wait to get that line ordered for the shop!